Thank you to NetGalley and Dial Press for the free digital copy of this book in exchange for my honest review. I was experiencing serious issues with one particular aspect of the book, which I will explain below, and I had encountered the line that was the proverbial “straw that broke the camel’s back” when I started having an internal battle over whether to continue reading or refuse to go on. Ultimately, my desire to know what happened won, and I forged ahead. Now that I have finished reading My Name is Venus Black, I honestly can’t say whether I’m glad I did so. Part of me was happy with how the rest of the book played out, but an equal part still struggles with one major issue with this book. My Name is Venus Black begins with a teenage Venus’s arrest for the murder of her stepfather, Raymond. The circumstances surrounding her actions are fuzzy, Venus initially refuses to explain to anyone why she did what she did, and she places most of the blame for what happened on her mother’s shoulders. She is sent to a youth detention center where she spends the next five years, but in the meantime, her seven-year-old brother with fairly severe developmental delays is kidnapped. The book then begins to take a few different paths, moving around among the actions and thoughts of several different characters and jumps forward five years in time to when Venus is released and attempts to begin a new life with a false identity. First and foremost, let me start by saying that I always have a hard time reviewing YA fiction. I always try to keep personal preferences from influencing my opinion of a book, because ultimately, I feel that the quality of a book should depend completely upon the quality of the writing itself. Young adult fiction can be difficult for me because I struggle to determine whether the writing is structured a particular way because of the intended audience or simply because the quality is not what it should be. My Name is Venus Black is written in a very simplistic style. If this was an intentional choice by the author, I can understand, but I still feel that it’s on a sophistication level more appropriate for middle grades fiction. If this had only been applicable to certain characters in the book whose maturity level is very low, that would make sense to me and would be an excellent choice on the author’s part, but the style is utilized for all the characters. In addition, the story is told from varying points of view throughout the book. In some parts, the point of view is first person from Venus’s perspective, and in others, when other characters are the focus, it is third person omniscient. This didn’t bother me much until the last few sections of the book. Once several characters begin interacting with one another, the shifts get much more jumbled and confusing. This technique might work at times, but it fell flat for me in this particular book. As for the plot, although it got a bit too cliche at times, there is only one element that I thought was weak–the reason for Leo’s kidnapping was a big stretch for me. I had a hard time believing that the motive was comparable to the severity of the crime. However, I also realize that real life works that way as well sometimes, so I didn’t let it bother me too much. There were definitely elements of the book that I DID appreciate, however. I thought Venus’s brother Leo’s character was wonderful, and the insight into his thoughts were well-crafted. Including the inner workings of a child with a developmental disability (most likely autism, in Leo’s case, although it is never named specifically) is not an easy feat, but I felt that Heather Lloyd did a good job with Leo. Lloyd also did an excellent job of weaving the concept of guilt and forgiveness throughout the book. Although Venus’s growth and maturity in regard to those concepts would be expected for a coming-of-age story, several other characters in the book go through a similar process. I also appreciated the way Lloyd tied all the stories together by the end, even if I didn’t love the point-of-view changes. So, why did I almost abandon this book? My reason is complicated. And I’m still conflicted about it, because I am struggling to determine whether my reason is a legitimate concern or I’m being too sensitive. My son is five years old, and he has a developmental disability (autism). When I read books that feature characters with autism, I’m always very cognizant of how they are portrayed, especially through the eyes of other characters. And I have to admit, My Name is Venus Black hurt my heart. Although I thought the author did a good job of crafting Leo’s thoughts, and I loved his character the most of all the characters in the book, she also made some decisions that left me in tears…and not because I was moved by them. For the first half of the book or so, Leo is referred to three times as “retarded” and “retard.” The use of that word in a work of fiction published in 2018 is completely unnecessary, in my opinion, regardless of whether the use of that word was acceptable in the time period the action of the book takes place or not. The first time it was used, it was spoken by Venus when describing Leo to another character. Venus. His sister. The person who, at that point in the book, probably loved and respected him the most. The second time it was used, a character was grocery shopping for food for Leo and “tried to think like a retard.” That was the moment when I put the book down and didn’t think I would pick it up again. Look, I get it. Authors need to portray characters and the world the way it really is and not sugarcoat it for the sake of sparing someone’s feelings. But the use of that word will never be phased out if it continues to be presented to others, especially young adults and children, as a normal part of speech. I know the book takes place during the 1980s and that word wasn’t seen in quite the same light as it is (or should be) today, but that doesn’t mean it couldn’t be replaced with a different word or left out entirely. Unfortunately, the use of that particular word is not my only qualm regarding the details included about Leo’s treatment by others. On three separate occasions, Leo is compared to a dog. On several other occasions, he is described as a “whack job,”a “weirdo,” and “not right in the head.” Several other times, characters talk about what’s “wrong” with him, including characters who seem to genuinely care about him. All the characters in the book also seem genuinely surprised that Leo knows basic things like the alphabet and colors, and their inability to distinguish between developmental and intellectual disabilities is disheartening and never addressed. I know life is not all sunshine and rainbows, and I know that those kinds of thoughts probably cross the minds of those who deal with kids like mine frequently, no matter how much I tell myself that everyone who meets my son loves him and sees his strengths, not his struggles. However, I felt that their use was far too excessive in My Name is Venus Black, and were mostly unnecessary. The details of Leo’s disability and the effect it has on those around him could have been handled in a much different manner. For all I know, Heather Lloyd might love someone with autism herself, and for all I know, their use might be toned down in the final copy of this book. I hope both of these things are true. Ultimately, the bones of My Name is Venus Black were fairly solid, and I might have even overlooked some of the issues I had with the writing a bit more, had my experience with the book not been different from most as a result of my deeply personal connection to an important element of the story. I wonder if my overall opinion would be different, if I didn’t have a child like Leo myself. However, I can’t help but feel that a wonderful character like Leo…and the entire community of people in the world with developmental disabilities…deserved a bit more respect. 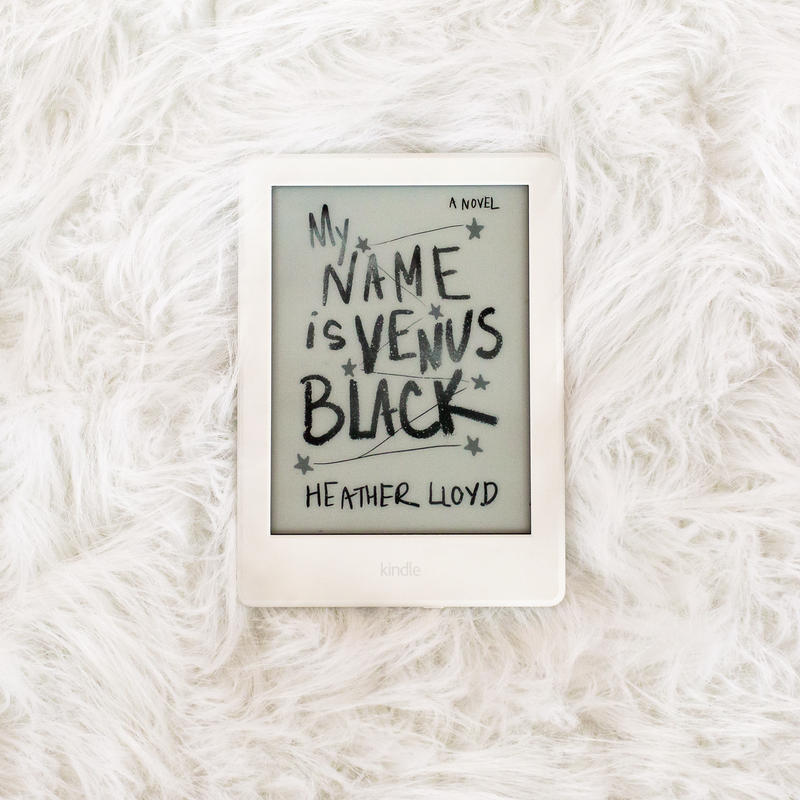 Posted in Young Adult FictionTagged book review, fiction review, Heather Lloyd, My Name is Venus Black, Young Adult, Young Adult Fiction, Young Adult Fiction ReviewBookmark the permalink. You’re a better reader than I! I’m pretty sure I would’ve abandoned because of the disrespect shown to those with disabilities. Unbelievable and unacceptable! Thanks for your honest and fair review. The “r” word hurts my heart and I’m sorry you had to read that! Thank you so much! I kept going because I kept thinking that maybe there was a reason for it that would become more clear later on, but if there was, I didn’t get it. All the other initial reviews don’t mention anything about it at all, and it made me worry I was being too sensitive. Trust your instincts! You are highly qualified to make these judgments! We all need to speak up in these areas! Just wondering……Have you considered writing the publisher to state your concerns?? Thank you! I sent them a note through NetGalley and included my review, so hopefully, they will take my words to heart. I hope not either! I will have to ask her.